What Changes Your Gums Go Through as You Age? Aging is a part of life and while most people make sure to care for their physical health so that they will encounter less problem when they get older, many fail to realize that their oral health also requires similar attention. Sadly, if you do not maintain the right oral habits when you are younger, you will surely encounter issues with your teeth and gums when you age. 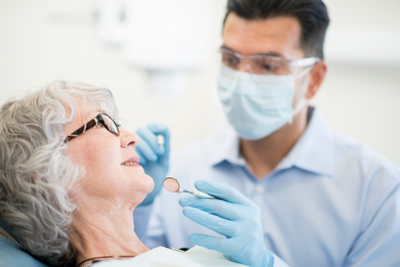 Studies have shown that older people suffer from higher rates of gum-related problems such as gingivitis and periodontitis, which is why it is critical that you visit us regularly, so we can address your gum and other oral health-related concerns immediately. While many older individuals suffer from gum diseases, it does not necessarily mean that you will experience the same fate as well. It is important for you to realize that gum diseases can be prevented by adopting healthy oral habits early and maintaining them as you age. For one, you should brush your teeth at least twice a day using a fluoride toothpaste. Secondly, make it a habit to floss regularly so that you can remove food particles and plaques in between your teeth. If you are a smoker, it is high time that you quit, not only for your lungs and general well-being but for your oral health as well. Eating a diet of nutritious food and avoiding sweets can also help you to avoid gum problems and other diseases. Lastly, it is critical that you visit us for a regular check-up and professional cleaning because brushing is not enough to completely rid and prevent cavities. Note that dental cleaning also helps in preventing plaque build-up that can, later on, cause gum diseases.